Accurate "As Built" drawings are an absolute necessity for flooring estimators. Pacific Solutions replaces the graph paper, tape measure, and pencil with a tablet and a Disto laser rangefinder. Measure one of the perimeter walls with the Disto and the laser will transfer the exact wall distance to the tablet via Bluetooth. Next, swipe the screen in the direction that you wish to draw the wall. Walk to the end of the wall, take the adjacent wall measurement, and swipe the screen a second time with the next line direction. The process is repeated until the entire room perimeter is captured. SiteDraw can even draw unconventional angles and arcs without using angle gauges. Rooms can be precisely aligned with each other using the door opening as the point of reference. The entire drawing can be sent to FloorRight Estimation Software where materials are assigned and the takeoff is completed. Are you a Flooring Dealer that wants a robust Floor Estimating Software? Good news! Your data from SiteDraw integrates with FloorRight Estimating software. 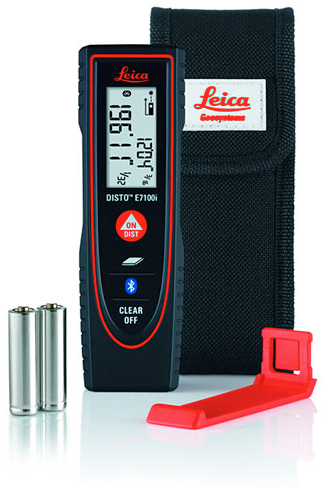 Simply take SiteDraw and a Leica Disto into the field. Quickly and accurately create an entire floor plan of the client's site, and upload the field-collected data into FloorRight! Once the data is in the estimating software of your choice, roll layouts, tile patterning, wood planking, carpet base, pattern matched goods etc. are all calculated with speed and ease! Measuring: Rooms are measured with the Disto A6 laser device and each wall dimension is then sent to the SiteDraw software. Drawing: Each wall is drawn sequentially and once the last wall is connected the SiteDraw shows a completed room. Positioning: A starting point is selected on the SiteDraw tool bar allowing you to draw the rooms in perfect relationship. Doors: There is a tool bar option in SiteDraw that allows the doors to be automatically and accurately placed in the room. Angles and Curves: SiteDraw beats all the competition without question when it comes to measuring Angles and Curves. It couldn't be easier! Naming rooms: Each room can be named by using the pull down “room name option menu”. Flooring products: A flooring product can be placed in each room and is represented by a product specific color. Notes: SiteDraw activates your Pocket PC recorder simply by touching the desired room and then audibly listing specific room conditions! Saved files: Files are saved by name and then imported into FloorRight Estimating software along with the playback recording of room conditions. Export options: Files can be exported in a number of ways: .DXF, .BMP, .GIF, .JPG, .XLS, comma separated text, etc. SiteDraw works with the Leica Disto! Would you like to discuss your business needs with one of our non-commissioned sales consultants?